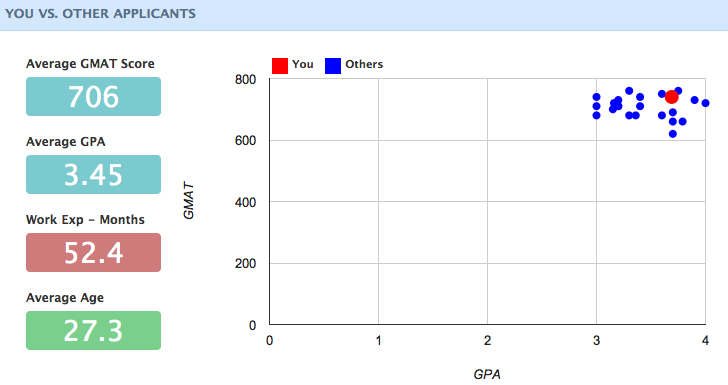 I recently found this great site called Beat The GMAT. They are an MBA oriented social network and seem to be a great source of information and they have a great community of folks in the process of or currently pursuing getting their MBA. I love great resources on all things MBA but Beat The GMAT has something no one else has…and it kind of blew my mind! You see, everyone who registers has to put in their GMAT score, their GPA, their work experience and other key MBA stats. Then they ask folks where they are applying and ask for updates on where they get accepted or not accepted. You can plot yourself for each school you are targeting and filter your demographic information. You can see how similar your stats are to people who got accepted into your dream school or, in the less desired scenario, how similar you are to people who were not accepted. Here is where I fell. All results are filtered to only show female applicants. 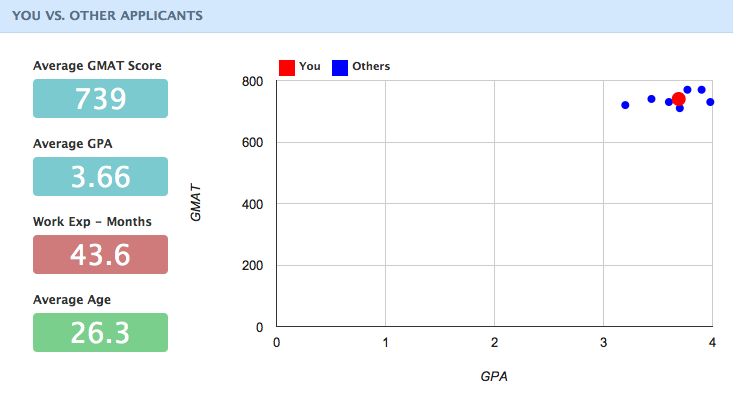 Not bad…looks like I am right in the middle of women who got accepted to Harvard. This leads me to believe that my chances will largely rely on my essays, the quality of my work experience and my extra-curriculars. Since this is my top choice, I was very happy to see that I have more of a shot than I thought! Okay…so there are some people with very similar stats that got rejected. This makes me feel a little less confident BUT it just confirms my thought that acceptance will largely depend on essays, work experience and extra-curriculars. I have had pretty solid extra-curriculars for the past year and a half and hopefully this will help set me apart (1 year as volunteer head of social media marketing ending last February for a small non-profit and the past six months teaching financial literacy to underprivileged communities. Also, I take intensive fine-arts courses at a highly recognized art academy in the area). Maybe, I should pursue more volunteer experience? The importance of essays and work experience to get into my top choice may be the deciding factor in seeking out the expertise of an MBA application consultant. Hmmmm…..we will see!